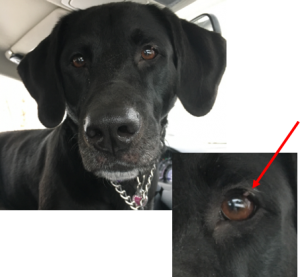 Madison, a six year old Labrador Retriever, was presented to Oswego Animal Hospital after her owner noticed a bump on Madison’s left eyelid. The bump had been present for a few months, but Madison recently started rubbing her face on the carpeting and pawing at her eye. The bump on Madison’s left upper eyelid margin was a small, pale, hairless, well defined tumor noted to be touching the cornea (transparent layer forming the front of the eye). Given that the tumor was causing Madison discomfort, the owner elected surgical removal of the mass. Madison’s eyelid was clipped of all hair and the surgical site was scrubbed with betadine solution to help prevent infection. A triangle shaped incision was made around Madison’s eyelid tumor using Metzenbaum scissors. The tumor was removed and the incision was closed with sutures. The owner elected to submit the tumor for histopathology to gain more information about Madison’s eyelid tumor. Madison’s eyelid tumor was determined to be a Meibomian Gland Tumor which is a non-cancerous tumor of the eyelid margin. The Meibomian Gland’s function in the body is to secrete sebum (oil) onto the cornea to help form the tear film and prevent corneal dryness. Meibomian Gland Tumors are the most common eyelid tumor in dogs and occur frequently in older animals. If the entire tumor is removed during surgery, the tumor will not grow back in that area. Madison did wonderful through her surgery and she recovered at home under her owner’s loving care. Madison had to wear an Elizabeth Collar for her recovery period to prevent her from rubbing at her eyelid stitches. She was prescribed anti-inflammatory eye drops to help with inflammation at the surgical site and provide pain relief. Madison was also prescribed antibiotic eye drops to help prevent a bacterial infection at the corneal ulcer site. At the two week recheck appointment after surgery, Madison’s eyelid had fully healed and the corneal ulcer had fully resolved.